Heat oven to 300 degrees. With fingers or a paper towel, coat well with coconut oil to prevent sticking. Mix all dry ingredients in a large mixing bowl. Add maple syrup last and evenly coat, turning with a spatula. Spread amongst two 9×13 glass baking dishes in an even layer. Place them on the top rack side by side. Bake for 20-30 minutes, rotating once about halfway through. 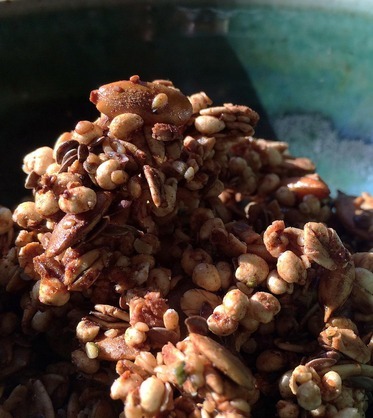 Granola is done when lightly browned. Let cool completely and then use a spatula to chip off baking dish. Store in an airtight container for 2-3 weeks.